It has been a tumultuous 10 weeks since Donald Trump won his stunning election victory, and on Friday he will be inaugurated as the nation’s 45th president. Here are six important findings from our U.S. political surveys since the election. 1Trump remains historically unpopular. Trump ended the 2016 campaign with the worst favorability ratings in history, according to Gallup. Today, public views of how he has handled his transition to the White House are the lowest for any president dating back to George H.W. Bush. Just 39% approve of the job Trump has done in explaining his plans and policies, while 41% approve of his high-level appointments, according to a Pew Research Center national survey, conducted Jan. 4-9 among 1,502 adults. These opinions have changed little since December. In January 2009, just before Barack Obama’s inauguration, 70% approved of the job he had done explaining his plans and policies for the future and 66% said they approved of his Cabinet selections. 2 Most Americans want Trump to be “more cautious.” The public continues to express doubts about Trump’s temperament. Nearly six-in-ten Americans (58%) say he will be “too impulsive” in making important decisions. Only about a third (34%) say he will be “about right,” while 4% say he will be too cautious. 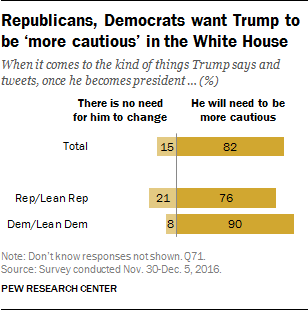 In December, a majority of the public (82%) also said Trump should be more cautious in “the kinds of things he says and tweets” once he becomes president. Just 15% said there is no need for him to change. Large shares in both parties – 90% of Democrats and Democratic-leaning independents, and 76% of Republicans and Republican leaners – said Trump will need to be more cautious when he is president. 3 The GOP’s image has improved. In the aftermath of the election, the Republican Party’s image is more positive than it has been in years. 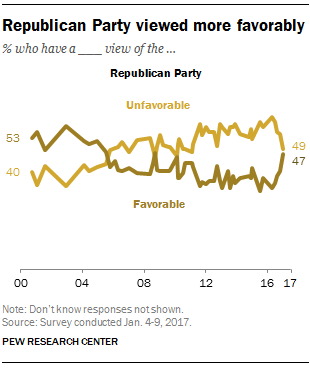 Currently, about equal shares view the GOP favorably (47%) and unfavorably (49%). The share that views the Republican Party favorably is up 7 percentage points since October and is 14 points higher than it was in April of 2016. Republican-leaning independents, in particular, have a much more positive impression of the Republican Party. About seven-in-ten Republican leaners (72%) have a favorable opinion of the GOP today, up 15 points since October and 29 points since April. 4 Views of Russia and Putin have shifted along partisan lines. In the wake of allegations that Russia was behind the election-year hacks of Hillary Clinton’s campaign and the Democratic National Committee, partisan views of Russia have changed dramatically. 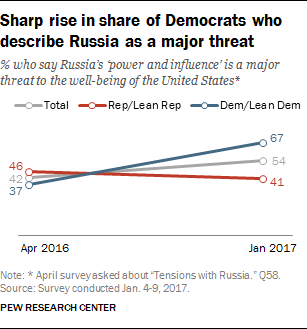 Currently, 67% of Democrats and Democratic leaners view Russia’s “power and influence” as a major threat to the U.S. Last April, just 37% of Democrats said “tensions with Russia” posed a major threat. Republicans’ views are little changed over this period, and today just 41% regard Russia’s power as a major threat to the U.S.
Russian President Vladimir Putin remains an unpopular figure among the U.S. public, with just 19% of Americans viewing him favorably and 69% giving him an unfavorable rating. However, the share of Democrats who have an unfavorable view of Putin have risen 10 percentage points since February 2015 (from 69% to 79%); among Republicans, unfavorable views of Putin have fallen 13 points (from 74% to 61%). 5 Democrats glumly approach a new era. For the first time in a decade, Democrats are shut out of power in Washington. Today, they are about as pessimistic about the new year as Republicans were four years ago, after Obama’s reelection. 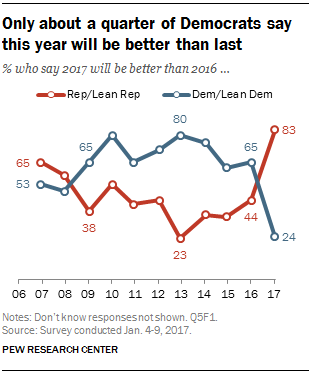 Just 24% of Democrats say 2017 will be better than 2016. By contrast, victorious Republicans are optimistic: 83% expect 2017 to be better than 2016. The Democrats’ gloom also has affected their view of the economy: In December, just 15% said they expect the nation’s economy to improve over the next year, down from 35% last June. Republican economic optimism, by contrast, has soared: 75% predicted the economy would get better, more than double the share who said this in June (29%). 6 Obama leaves office on a high note. The soon-to-be-former president leaves office with an approval rating of 55%, among his highest ratings since 2012. Obama’s job ratings, which had been mixed for the early portion of his second term, moved into positive territory in June and have stayed there ever since. In December, however, the public expressed mixed views of Obama’s accomplishments: 49% said his accomplishments will outweigh his failures in the long run, while 44% said his failures will outweigh his accomplishments. In the public’s view, Obama will be most remembered for health care and the Affordable Care Act. But Republicans have already started to take action to repeal the 2010 law.